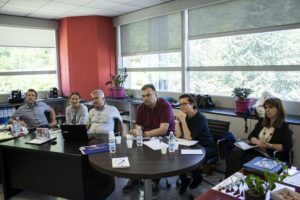 The fifth ICAP project meeting took place on Friday, June 15th in Longarone, at the headquarters of Cerottica S.c.r.l. • Giuseppe Da Cortà, Marco Calvi, Melany Dalle Ceste – Certottica S.c.r.l. During the meeting the state of progress of the project is analyzed and the possibility to extend the project beyond the established deadline. The project website is a good source of information for companies so partners discussed how to keep the ICAP website up to date with new documents and presentations even when the ICAP project comes to an end. Partners discussed about relationships with the companies within program area. Certottica is in touch with various local companies that are interested to perform plasma treatments to improve gluing performances and also to get a better carbon footprint certificate. W3C observed that many companies are interested in the plasma application of metal layers on wood and paper, but some problems were spotted especially concerning the industrial scale treatments. W3C is in contact with a Belgium company (Molecular Plasma Group). Partners presented respective results about treatments and tests. W3C (Judith Sinic): they are testing plasma surface activation on several kind of materials: on paper, on wood and wood panels, on natural fibers and wood plastic composites (WPC). Innova FVG (Luigi Valan): they are testing (by the support of local companies) Nano-ceramic coating on knifes, tools, cutters, chrome coating. Two workshops will be organized during September 2018: one in Certottica focused on plasma torches and nozzles and another in Innova FVG on Nano-ceramic coating. Next meeting will be held in Innova FVG at the end of October 2018 (planned at 31.10.2018).